7TH GRADE B TEAMS TAKES 3RD PLACE WITH A WIN IN THE DISTRICT PLAYOFF GAME! The Bear Branch 7th grade B team didn't have an easy playoff game. 7B won the 1st game in the match with a nail biting score of 26 to 24. Cassie Cleveland showed hustle the entire game, making 2 amazing saves. Madison Saldana served 6 points and scored 3 points with strategically placed tips. Anna Sorensen won 5 points with her serves. The Lady Bears headed into game 2 slightly on edge from game 1's intensity. 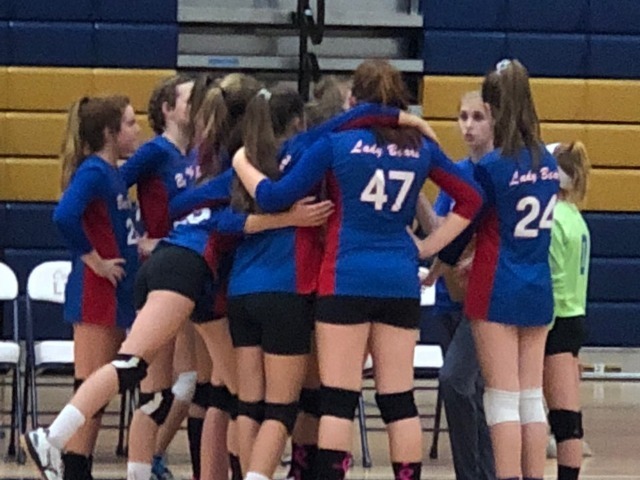 Madison Saldana, Emerson Cykoski, Kailani Cromack, Summer Cosman, and Kylie Murphy scored numerous points from their serves that were shanked by the Oak Hills Junior High team or were aces. 7B lost game 2 with the heartbreaking score of 23 to 25. 7B had a rocky start to game 3, but they quickly turned it around. Cassie Cleveland made several incredible saves. Kylie Murphy was not letting any ball hit the floor; she had great passes and 2 back row hits! Anna Sorensen served 5 points. Carissa Thelen and Kailani Cromack dominated the middle front with their kills and tips. 7B earned their 15 to 8 win, giving 7B a great end to the season! The night's overall match player was Michele Salas. Salas never stopped moving through all 3 games. Her hustle made the several saves she made, especially in game 2's intense volleys, possible. Salas's court confidence shined as she made kills (hits), tips, and dug the ball out of the net. The Lady Bears 7th grade B team had an amazing season. Each player made phenomenal improvement since 7B's first game. They ended the season with 9 wins and 1 loss.